Running a marathon below 3 hours – a dream that came true for our running.COACH User Chris Howard. Together with our Gold Coach Gabriel he improved his form to be a more efficient runner and less prone to injury. 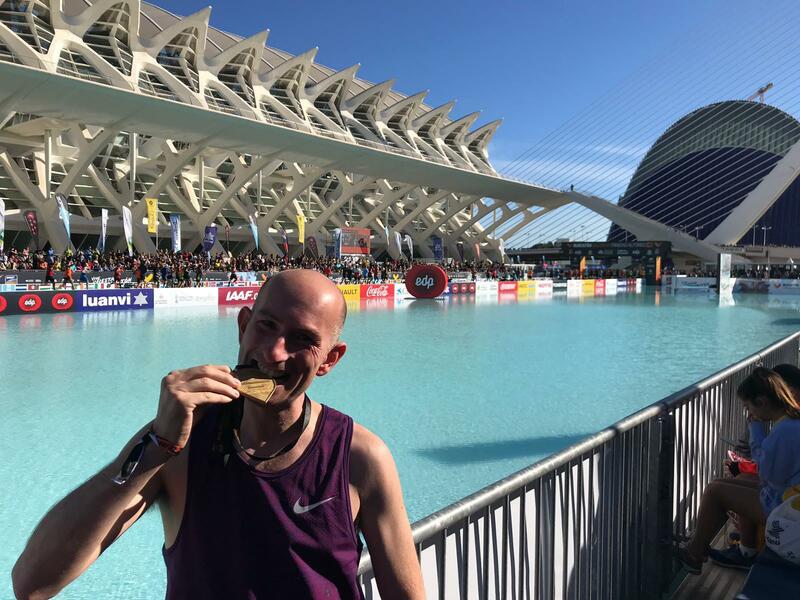 Very sucessful, as you can read here in his personal report about his journey to the Valencia Marathon. I started running 5 years ago once I hit 40 years old – either this was due to a mid-life crisis or to just generally get fit and remove the storage space around the tummy. My first marathon in Lucerne of just over 4 hours was hard but the feeling at the end got me hooked for more. Over the next few years I got better by adding the miles and then signed up with running.COACH silver subscription and was able to bring my time down over the next 2 years to 3.14 in Berlin and then 3.09 in London. I was following the plan, obtaining excellent advice and was really happy with my progress. However, I then wanted to achieve the next level and achieve under 3 hours. This became the running dream. Unfortunately, I had a few injuries which kept on pushing me back and then I did Chicago and got a 3.32. Why was I getting further away from 3 hours and not closer? A friend recommended me to have a personal coach and use the running.COACH Gold subscription. I signed up in June 2018 for a 6 month subscription and Gabriel Lombriser would be my coach for the next 6 months. I was advised at the beginning about a running day being conducted in Nottwil and I learned more in that day about running style, efficiency, mobilisation, specific training etc. than I had done by looking at over 100 Youtube videos. At the beginning of the subscription I had a detailed discussion with Gabriel about injuries, aims, personal lifestyle, nutrition etc. Gabriel then created a plan for me. Gone were the 6 days of training over 100km per week and I was shocked to see only 60km per week and 5 trainings. Gabriel fully understood my injury history and accommodated my plan to this to ensure I had continuous training and not to be constantly interrupted by injuries. Throughout the next 6 months I could have an easily accessible view of my plan on my phone and receive detailed tips per run. The training got easier and then more intensive as time went by. Constant communication with Gabriel ensured I was on this journey as a team and not by myself (every question asked was answered quickly with excellent advice). I was advised which test runs to do and these were built into the plan. Constant feedback after the test runs was given by Gabriel as to how I could improve in the next run and by putting this advice to practice, I noticed constant improvement. However, it was the constant change to the norm in runs which I was advised to do which helped me significantly. Valencia marathon then arrived and I felt good. A detailed discussion took place between Gabriel and myself a week before about tapering, nutrition and marathon pacing strategy. I felt confident. Then the day before the marathon, Gabriel called again to provide me with some key tips and encouragement. The marathon went like a dream. The splits were the same for every 5km and when I felt tired at after 30 kilometres I kept on repeating the advice Gabriel had given me and I found some new energy. When I hit 40km I knew I could do this if I hanged in there and suddenly I was able to run the last 2km in 3.51min/km – this was due to the change to the norm training Gabriel had advised me to do. The feeling of running up to the finishing line and seeing the clock being under 3 hours was highly emotional. All the training had been worth it and the dream was fulfilled when I crossed the line in 2.59. I have learned that you don’t need to do 120km+ per week training to achieve under 3 hours. Instead, you need a brilliant coach who understands injuries, plans, lifestyle etc. and is fully with you on the journey to achieve a running dream. This was teamwork. I thank Gabriel and running.COACH so much for making this happen and being a core part of this amazing journey. The online coaching platform at running.COACH is great for individualized training programs. It allows you to find your own time to run and you know the workout was made just for you based on your training progress and goals. With the silver subscription you can ask our coaches two questions by email per month. If you want to have a personal coach on your side the whole time, then benefit from our Gold Coaches and their long-time experience in running and coaching. Sign up and test running.COACH for free.